Baseball season is on its way. Opening Day is a week from tomorrow and, before I start posting my previews for each division, I'd like to first get a little warmed up for baseball writing with a few posts on various things related to baseball. First up is an inventory of all the major league ballparks I've ever been to. Doubtless, there are better places to spend summer days, summer nights, than in ballparks. Doubtless. It was here that I attended my first baseball game ever on July 21, 1995. My brother John brought me to a game as a birthday present (it was a few days after my 10th birthday) and the annual outing to Yankee Stadium would become a birthday staple over the next few years until I defiantly renounced my Yankee fanhood right around the same time everybody started jumping on the bandwagon. My favorite player growing up was Jim Leyrtiz, the bat-spinning back-up catcher and first baseman (who was obscure in those days but went on to become a World Series hero). Each year, John would choose the perfect game to attend, somehow always knowing which games Leyritz would be starting. That first game in '95 Leyritz actually started at first base against the Texas Rangers' lefty Kenny Rogers (Leyritz was replaced by Don Mattingly later in the game). The Yanks won 8-3 and the winning pitcher was Dave Eiland who went on to become the Yankees' pitching coach for these last three years. I saw a bunch of games here over the years with various people: John and I went to Game 1 of the World Series in 1996 when the Yanks got shellacked by the Braves (though I got to see Jim Leyritz catch the whole game); during the summer of my first job in 1999, working as a messenger for the company both my mom and John worked for in lower Manhattan, a co-worker named Lou decided one day that we should skip work and go watch an afternoon Yanks-Blue Jays game from the bleachers; Baseball Prospectus writer Jay Jaffe brought me along to an ALDS game against the Tigers in 2006; and I got to say my last goodbyes in an early season game against the Rays in 2008, right before moving to San Diego (that was the Yankees' last season in the old stadium). My Aunt Jeanie brought my brother Billy and I to a game here in '95 or '96. It was Billy's first game ever and it was the Phillies against the San Diego Padres, an interesting augur because ten years later Billy would take up residence across the country in San Diego (which led to me moving out there too). That night, Billy caught a foul ball in his hat (!) that was lined off the bat of Pads' outfielder Melvin Nieves. I remember the stadium was enormous and imposing. A Saturday night interleague game against the Angels (John's favorite team) in which the Mets rallied twice in the late innings and won. Marlon Anderson tied the game in the bottom of the ninth with an inside-the-park homerun (!) against current Mets closer Francisco Rodriguez. After surrendering a run in the top of the 10th, the Mets put two guys on base with their best hitters, Carlos Beltran and Piazza, coming up. They both struck out. It was all up to Cliff Floyd. He worked a full count, fouled off about a hundred pitches, then struck a monster homerun to win the game. Floyd was hurt so much in his career and is retired now but he provided a bunch of great evenings for Mets fans during a two year stretch. This was probably the most exciting game I've ever witnessed in person. I was sitting with John and his wife Kristina in one of my favorite spots in Shea: near the foul pole in fair territory out in left field. A Friday night game against the Phillies that was rain-delayed for about 3 or 4 hours before getting under way. I was at the game with John, Kristina, and my little sister Emily. John and Kristina left early because it was late, wet, and freezing. Me and Em stayed til the bitter end and got to see Carlos Beltran launch a walk-off bomb which had us jumping up and down and screaming with our cheap ponchos on. Witnessed the last two games in Montreal Expos history as they played two meaningless matches against the Mets on the last weekend of the season at Shea. The Mets and Expos both stunk that year and I lucked into having tickets to both of the last two games fall into my lap. For the final game, I remember Todd Zeile started at catcher for the Mets in his own last game before retirement. I watched that last game with three of my siblings on a crisp, sunny October afternoon as the Mets won 8-1 and the Montreal squad tossed a bunch of memorabilia to a group of devoted fans gathered above their dugout. When it first looked like the Montreal Expos were going to be no more (the league was seriously talking about cutting two teams, they'd eventually settle for moving the Expos to Washington), my brother John, ever ambitious to go on a baseball trip (a trait he instilled in me, thankfully) drove us up to Montreal for a weekend set against the Toronto Blue Jays. The Expos were a pretty good team in those days and we saw two entertaining games in that funky old stadium including a Sunday afternoon battle won on a walk-off smite by the 'Spos. I'll use a * to indicate the stadiums I visited without getting to see a game there. My old Staten Island pal Joe and his mom brought me up to Toronto and Niagra Falls one year and we stayed in the hotel inside of the Blue Jays' home stadium. It was the offseason, though, so nothing was going on but we did sleep within the stadium and could see everything just outside our window. Went to a game here while visiting my sister Laurie in Atlanta years back. I don't remember much about the game except that we sat in dead center, right next to the Braves bullpen (which has three mounds) and a few relievers, Paul Byrd chiefly among them, threw unopened sunflower seed packs to me and Billy after the game. Another weekend baseball roadtrip with brother John. It was a beautiful, scenic drive through Pennsylvania and the stadium is one of the nicest I've ever seen, situated right at the intersection of Pittsburgh's three rivers. The Pirates played the Dodgers in a couple of forgettable games but the beauty of the stadium and the city sticks out in my mind the most. After the first game there was a fireworks show that was surreal---it incorporated not only the three yellow bridges beyond the outfield wall, but even the skyscrapers across the river. Best fireworks show I've ever seen. When it first opened I took the train one day by myself (I was 18) and watched a game between the Phils and Tigers. The Tigers were atrocious in those days and the Phillies killed them. Over the years, I went to a handful of games here with my brother James and his three sons. In a homerun derby type of game against the Brewers, the guy sitting directly next to us caught a homerun on a line-drive (and we were in the second deck). When my brother Billy finished Navy bootcamp in June 2006, my whole family went over to Chicago for the graduation ceremony. After seeing him for a very short time, we had the whole night to ourselves in Chicago. 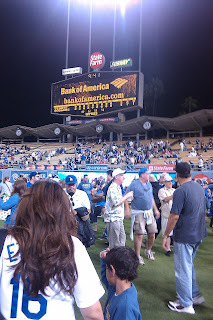 Of course, I wanted to go see a baseball game and the Dodgers were in town for an interleague game with the Sox. Unfortunately, nobody in my family would join me but I took up my dad's offer to drop me off in the South Side and went to the game by myself. It was a lovely June evening and they were commemorating the 1959 World Series between the Sox and Dodgers. The Pale Hose won behind a great game from Mark Buehrle and I somehow ended up with a White Sox towel and then a White Sox credit card which I used for a few years. The next day after the White Sox game, my dad and I went to Wrigley and took a guided tour of the whole stadium. Great experience and, interestingly enough, the Cubbies were in New York playing the Yankees at the time. 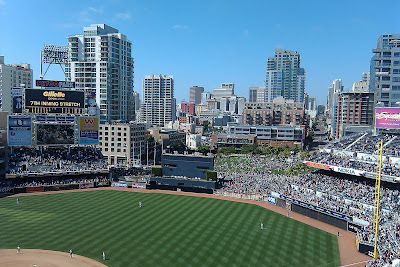 When I passed through Chicago on my way to California in the summer of '08, my brother Billy and I walked a lap or two around the outside of the stadium while the Cubbies were playing in...San Diego. Oh Petco, how I love thee. After my first visit in 2006 (a memorably explosive game against the Braves) for my 21st birthday, I saw probably 25 games there over the next four years. I absolutely love this place and have so many good memories from there. 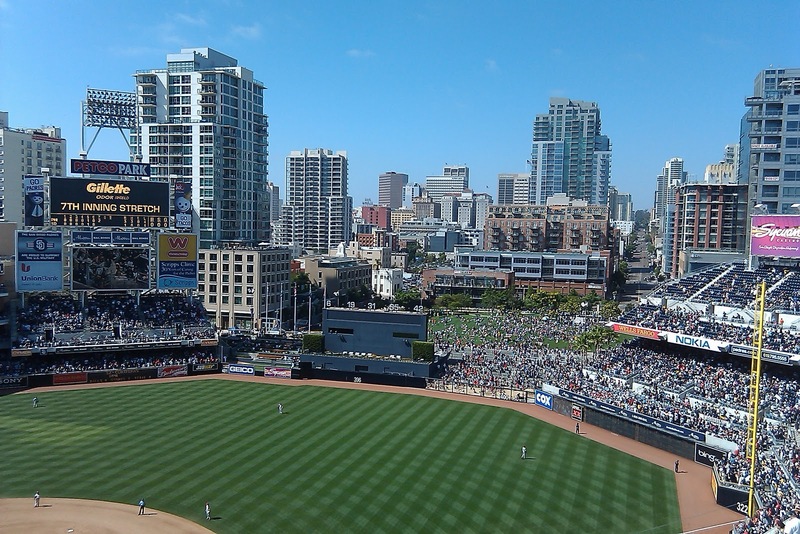 Thankfully, many of them are preserved on this very blog but I really, really miss going to games there and hopefully will be back in San Diego one day. When I first moved there I got to live my dream: I was living in a rinky-dink studio apartment only two miles from the stadium so, on more than one occasion, I walked from my house to a baseball game. I could go on forever about this place but I'll stop now. First, did a stadium tour in the summer of 2007 while in Boston for my cousin Mary's wedding. Then, less than a year later, spent a weekend with Mary and her husband and they took me to a game. We sat out in the bleachers and watched the Red Sox and Milwaukee Brewers trade bombs all day. The Sox won 11-7. I've been itching to get back there ever since. During the 2008 cross-country road trip, one of the main stops was in Milwaukee so we could see a baseball game. They played the Arizona Diamondbacks with the roof closed (it was raining outside) and smoked 'em. After the game, Billy and I got to walk along the field because it was Senior Citizens Day and the elderly couple seated next to us said "come with us, you can pretend we're your parents." The people of Milwaukee are great. Another blurry photo from my clunky old camera. In August of 2008 I visited San Francisco to look at a grad school I planned to attend, the California Institute of Integral Studies. The school was nice although far too expensive for me but I did get to go see a game while up there. It was an absolutely frigid, cloudy night in August and the Giants played the Braves in a meaningless game when both teams were out of the race. Yet, the stadium was packed and rowdy. This was a rare instance where I didn't stay for the entire game because I was just too cold, didn't prepare for winter weather in August. Got to do a full tour of the stadium, including dugout and clubhouses while the teams were present. Even spoke to Howard Johnson while he was on an elliptical machine. Did it all while posing as an electrician, hard hat and everything. Amazing and memorable experience, though I won't reveal how I ended up having the opportunity. Don't want to get anyone in trouble. Fun, rowdy place. Went there this past summer with my girlfriend for my 25th birthday. Fun time though it was sweltering until the sun finally went down. We sat in the absolute last row of the stadium along the first base line and yet the view of the field was actually pretty good. Our view of the mountain range beyond the stadium was even better. An absolutely gorgeous stadium that seems like it was plopped down in the middle of a dense verdant forest. Went with bro Billy for a September matchup between the classic old New York rivals, the Giants and Dodgers. Sat very close to the field but was annoyed most of the people around us didn't seem to care that much about the game. When the game was over we got to walk right onto the outfield grass and watch a fireworks show, though. Now that I've listed everything, I realize that during my three years living in California I went to every major league baseball stadium in the state except the Coliseum in Oakland. It's known as one of the worst facilities in professional sports but still, the A's are one of my favorite teams. All the more reason to go back there. I'm currently situated in the middle of Texas, at least three hours from a pro baseball team but, as a diehard seamhead, I will definitely be taking the long drive to both Houston and Arlington to add those to my list.